Up to 10,000 new homes and more than 22,000 new jobs will be created as part of plans to revitalise the Liverpool city centre in a collaboration between the NSW Government and Liverpool City Council. Planning and housing minister Anthony Roberts yesterday announced 25 hectares of land within the Liverpool CBD had been rezoned from commercial to mixed use to kick start the process. “I am pleased to announce this plan which will transform Liverpool’s commercial areas and unlock the city’s potential as a thriving and well-connected place to live, work and play,” Mr Roberts said. Mr Roberts said the NSW Government has worked together with Liverpool City Council and the local community to ensure a new and improved neighbourhood was built with a mix of new housing and businesses to benefit the local area. “Liverpool’s transformation has the potential to be enjoyed by locals and international visitors, with the city centre being on the doorstep of the future Western Sydney Airport,” Mr Roberts said. 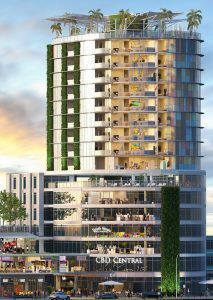 The rezoning enables increased building heights for selected key sites and will ensure people have easy access to public transport, the city campuses of both Western Sydney University and University of Wollongong and Liverpool Hospital’s $740 million redevelopment. 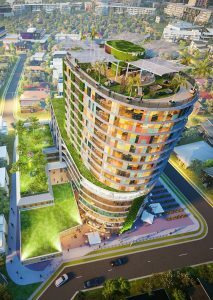 “Once complete, the project will create a healthy, socially connected and culturally rich community which will benefit from a modern living lifestyle and have access to a vibrant night-time economy,’’ the minister said. Council’s plans to rejuvenate the Liverpool CBD will see improvements to pedestrian and cycle paths throughout the city to enhance access to the Georges River. A key focus will be allocating green grids and preserving open space community areas with enhanced walkway connections through the city. Liverpool City Council Mayor Wendy Waller thanked the NSW Government for working with council on the changes to the Liverpool LEP, which will transform one of the fastest growing regions of Sydney. “By allowing homes and a mix of businesses in the Liverpool CBD we can encourage a lively city neighbourhood, with new lifestyle and entertainment facilities which will provide a vibrant night time economy,” Ms Waller said. Liverpool City Council prepared a planning proposal to rezone the town centre and following a Gateway determination by the Department, the council exhibited the plans. In response to submissions received, council provided further clarity and more certainty to the public about what to expect for the future of Liverpool. Council will next consider development applications.